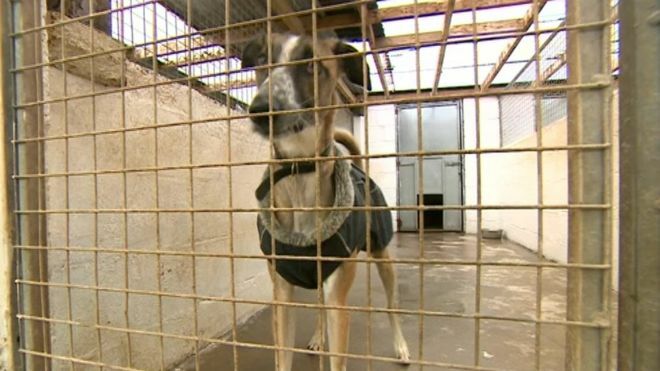 An animal rescue centre has been ordered to stop its homeless hounds from barking – after a new neighbour lodged a noise complaint. Ark Animal Rescue in North Somercotes, Lincolnshire, was told the local council had received multiple complaints about doggy disturbances. The charity has five months to reduce noise levels or face legal action. “I’ve got to be seen to be stopping the dogs barking and I’m not sure how to do that,” said Sue Rice, from the centre. The Ark, which opened 33 years ago, houses almost 30 dogs and a selection of other animals including donkeys, cats and goats. It is thought someone who had moved to the area within the last few years made the complaints, prompting East Lindsey District Council to serve the noise abatement order. Ms Rice said the decision could have far-reaching consequences for the charity and its animals. “The worse case scenario is we can’t take any more dogs, or we have to re-home the ones we have – which hopefully won’t happen,” she said. She said other animals at the centre would also be “under threat” due to a possible loss of donations. Jon Challen, public protection officer at the council, said the authority had not taken the decision lightly but was duty bound to investigate complaints. “When presented with the evidence and the amount of dog barking going on… we were left in no position but to serve a notice,” she said. The council said it investigated all noise complaints regardless of how long someone had lived in the area. The complainants were approached by the BBC but did not wish to comment. Since the news emerged, supporters have taken to social media to defend the centre. “Who would move next to an animal rescue centre and then complain about the noise?” wrote one Facebook user.